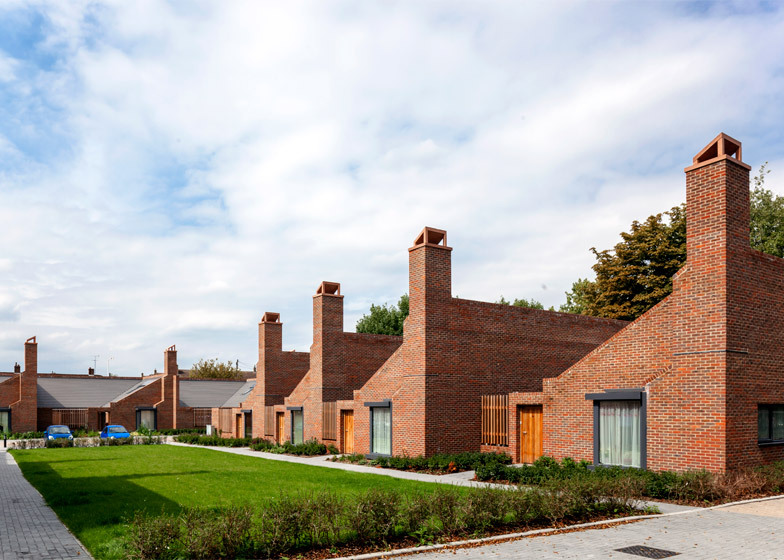 Tall brick chimney stacks and half gable profiles characterise these east London bungalows by Patel Taylor that are designed to house the area's retired residents (+ slideshow). 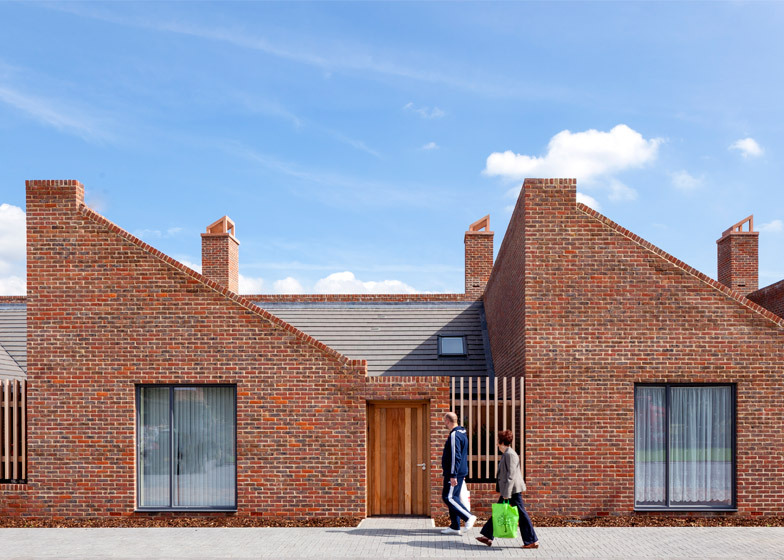 London-based architecture studio Patel Taylor, lead by Pankaj Patel and Andrew Taylor, was commissioned by the local council to design the red brick housing scheme in Barking, an area in east London. Two brownfield sites – land once used for industry – were earmarked for the development called Courtyard Housing. The first provides a plot for 27 houses, while 12 homes sit on the second. 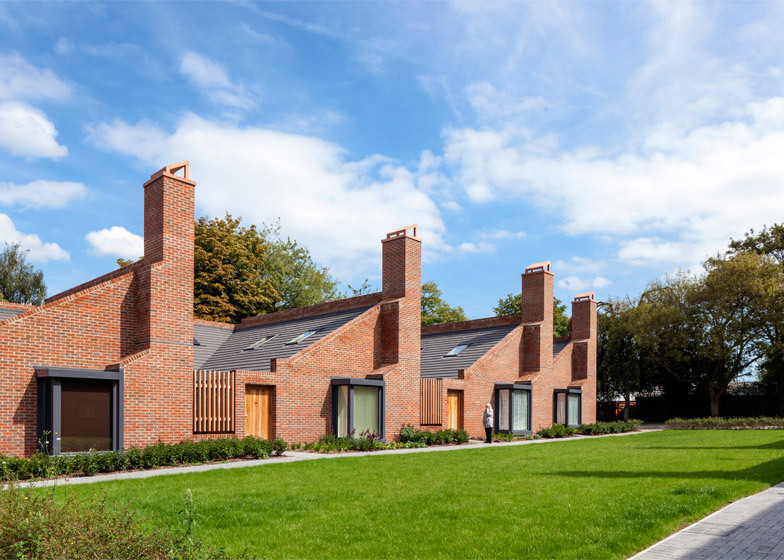 The scheme is based on the concept of the traditional English almshouse, where disused sites and accommodation are provided by charitable bodies for people of retirement age who are unable to support themselves. While the houses were built for the borough's ageing population, the intention is that the scheme will have a knock-on effect, releasing larger council houses for families. 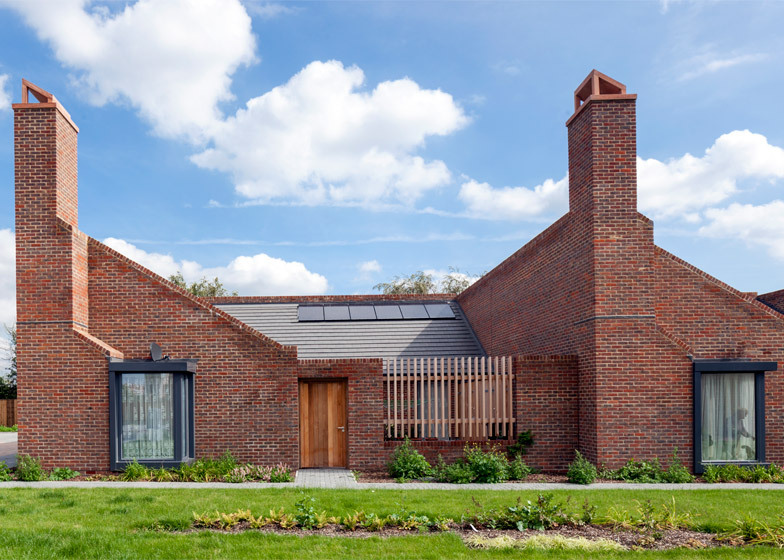 "Derived from a rich heritage in the UK of housing for the elderly – known as the English almshouse – these homes maximise land usage for the borough and provide council tenants with quality of life and pride in their homes," said the architects. 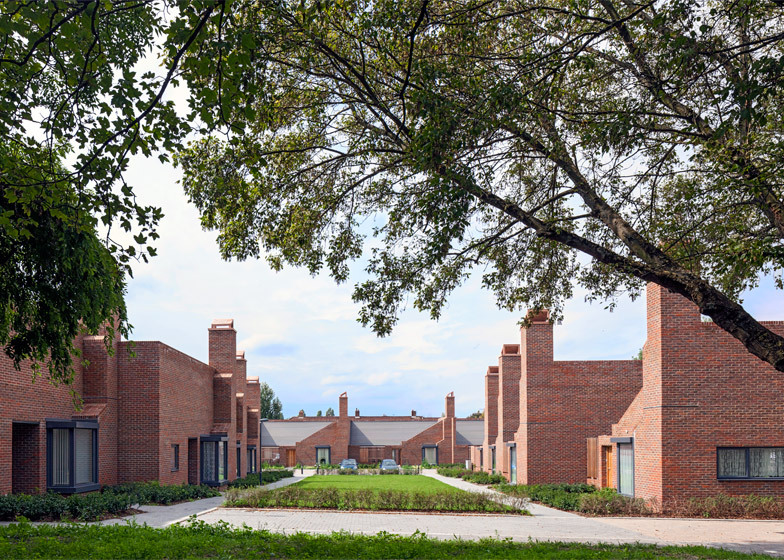 "The Courtyard Housing project represents a radical shake-up of an established design typology and provides a series of spacious single-storey dwellings for elderly residents, freeing up larger council properties for families in desperate need of homes," they added. Homes are wheelchair accessible, with a living room, kitchen, bathroom and either one or two bedrooms arranged within an L-shaped plan. This layout provides a small private courtyard within the boundaries of each home, accessed from the living spaces via a glazed wall. It also allows the houses to be pivoted and slotted together in varying formations to suit the specific plot. "The houses have been designed so that they can be rotated easily on any site to take advantage of sunlight coming into the gardens, and can be delivered in large or small groupings depending on the space available," explained the architects. Each home features a tall chimney and a large box window facing out from the living room onto a communal space. 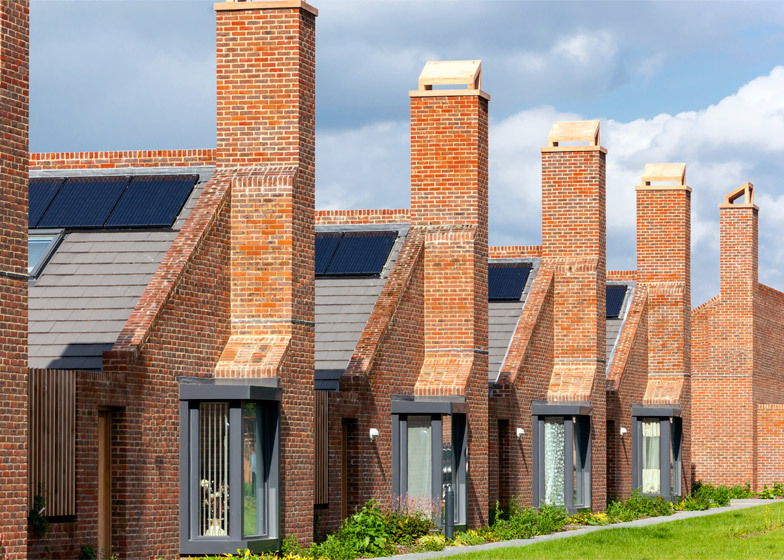 The combination of the pitched tiled roofs, chimneys, and bay windows is intended to reference typical suburban housing, while slight variations in interior layout give each household the opportunity for personalisation. "This demonstrates that thoughtful design can provide high-quality social housing on a budget, unlocking land and other properties at a time when accommodation is the biggest challenge facing all London boroughs," said the design team. Landscaping surrounding the estates is intended to provide a meeting space for occupants and to help foster a sense of community. Photography is by Peter Cook.